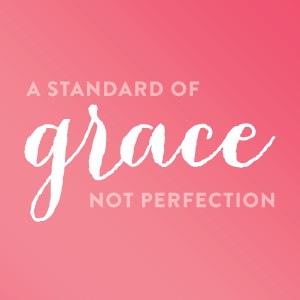 A little over a year ago, I wrote a post called Grace Not Perfection. It all stemmed from an exhausted conversation I had with Lara regarding life as a new Mom. Since then, the words have impacted my life over and over again. They’ve become a catalyst for converstaions between women about what really matters. I’ve been amazed as this phrase has become a mantra for women balancing life, work, children, marriages and friends (among a billion other things). I’m convinced those words were a sweet message from the Lord reminding us to focus on what matters most. I’ve loved watching this little message spread through Pinterest and across blogs. It even made it onto Glamour.com and onto the lovely Lauren Conrad’s Pinterest board. So three days into our last Making Things Happen tour, I thought I’d create a few badges for those of you who believe in this message as well. Please feel free to post them on your blog or site to help spread this good news to other busy women attempting to do it all… perfectly. Simply right click the images below and save to your desktop to upload them into your sidebar. If you’d like a print for your office or home, we still have a few limited edition prints of this phrase here. For a limited time, all our gold Grace Not Perfection prints are $20. In exchange, I’d love for you to leave a note here letting us all know what Grace Not Perfection means to you. It’s time to hold ourselves to a higher standard – a standard centered on what really matters. Love to you all.